Care for a little space-based sightseeing? Feel the need to study abroad -- really, really abroad? Well, fling away your Fodor's and toss your TripAdvisor, because we have the only guided tour you'll need -- a foray into the final frontier so ambitious it will make the Voyager probes' Grand Tours look like daytrips. Of course, zipping off to distant planets, moons and stars isn't as simple as thumbing a ride with a Vogon or booking passage with a Corellian smuggler and his Wookiee copilot. We'll have to break a few laws of time and space. There's a good reason Carl Sagan's landmark series, "Cosmos," resorted to a Spaceship of the Imagination: His destinations were mostly unspeakably dangerous or unreachably distant. And then there's the problem of time: Because light obeys a speed limit, our pictures of stellar objects are actually images of the past. By the time we reach them, they might have changed or ceased to exist. Fortunately, we recently found an indestructible, time-traveling ship in a box of TARDIS Flakes (part of a past or future nutritious breakfast). It comes complete with scanners that detect all spectra, so we're guaranteed not to miss sights better seen in ultraviolet, infrared or X-ray. So, without further ado (and as another space-time traveler would say) ... allons-y! What better way to kick off your space sightseeing tour than following in the footsteps of the trailblazers? And what better place to honor space pioneers than the site where Apollo 11 touched down and humans first put boot to moon dust? Visit the Eagle lander, blow some dust off of the lunar laser ranging retroreflector array used by Earth-based scientists to measure lunar distance, and literally walk in the still-preserved footprints of Neil Armstrong. Then again, maybe you should just take pictures -- and set up some really, really high museum rails to compensate for the moon's low gravity (about one-sixth Earth's). Not coincidentally, Mare Tranquillitatis also happens to provide ideal landing conditions, by lunar standards. It's flat, smooth and slopes a mere 2 degrees [source: NASA]. But why stop there? Head to Apollo 14's Fra Mauro Formation and hunt down Alan Shepard's golf balls, then take Apollo 17's moon buggy for a spin around the Taurus-Littrow valley. If nothing else, it'll be worth the trip just to finally stifle those conspiracy wing nuts who say NASA staged the moon landings at a Burbank studio. Choosing a land feature that sprawls across a quarter of Mars might seem like cheating, but it's our list, so we make the rules. Sure, we could have chosen Olympus Mons, a shield volcano the size of Arizona and three times the height of Mount Everest, but how would exploring that monster be any easier? Or, continuing eastward past its three smaller sisters in the Tharsis Montes group -- which range from 210-270 miles (350-450 kilometers) across and rise 9 miles (15 kilometers) above their surroundings -- we could shoot down the Valles Marineris. Longer than the United States is wide, the grandest canyon of all girdles one-fifth of the planet, running more than 2,500 miles (4,000 kilometers). Indeed, its 120-mile (200-kilometer) width and 4.3-mile (7-kilometer) depth make our Grand Canyon look like a side gulley [sources: Miller; NASA; NASA]. But wait, we hear you say into your subspace communicator, doesn't this constitute a series of landmarks? Not according to some theories about the region's history, which argue that the Tharsis formation is actually one gigantic volcano (based on a broader definition that includes underlying tectonics and magma flows). Under this model, even the titanic Olympus Mons is but a wart on the face of the solar system's vastest volcano [source: Fazekas]. 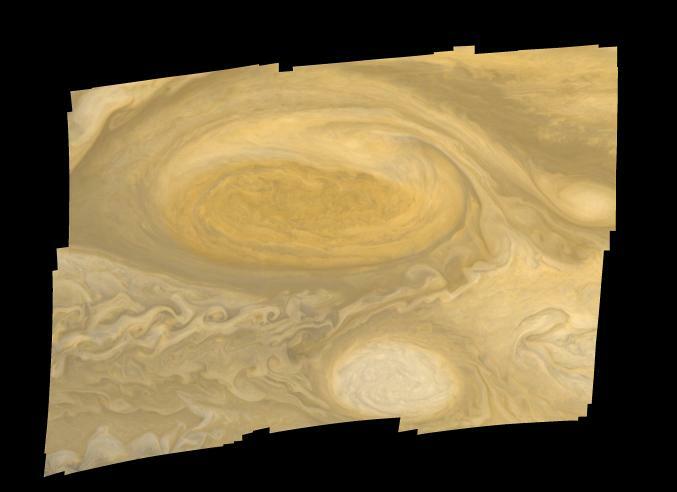 If you were looking for one landmark to distinguish our solar system -- sort of a "turn left at the burned-out Chuck E. Cheese" on an astronomical scale -- you could do far worse than Jupiter's Great Red Spot (GRS) -- or rather, spots. In 2000, the Hubble Space Telescope witnessed a second spot, nicknamed "Red Jr.," arise from the collision of three smaller spots. In 2008, Hubble spotted a third [sources: Daniels; Phillips]. The fact is, these cyclonal beauty marks whirl about the faces of the other gas giants, too, and possibly on their close cousins, the cool, starlike bodies called brown dwarfs. They just tend to come and go. And that's what makes Jupiter's two-to-three-Earth-wide anticyclone so special: Depending on whom you ask, it's been spinning for at least 136 years, and possibly longer than 349. Why the age gap? We know today's GRS was described by American astronomer Carr Walter Pritchett in 1878, but some believe it's the same "permanent spot" observed by Italian astronomer Gian Domenico Cassini in 1665 [sources: Encyclopaedia Britannica; Clavin; Daniels]. As for scenic overlooks, we recommend keeping your distance, both to take it all in and to avoid its 250-mph (400-kph) peripheral winds [source: Encyclopaedia Britannica]. Yellowstone National Park's Old Faithful is a superheated squirt gun compared to the geysers found on Jupiter's fourth-largest moon, Europa. Roughly the size of Earth's moon, its jets spew water more than 125 miles (201 kilometers) high when squeezed by the gravitational tidal forces of the gas giant and its major satellites [sources: Daniels; Lemonick]. Europa's icy surface makes it cue-ball smooth compared to Jupiter's other Galilean satellites (the four largest of Jupiter's 50-67 moons). Still, its icy surface possesses an exotic beauty traced out in veiny fractures across its crisscrossed shell. These cracks hint at the moon's possible structure, which scientists believe consists of a mile-thick icy covering overlaying a subsurface ocean. The same gravitational forces that drive Europa's geyser activity could provide enough energy to keep water from freezing solid, even on a moon half a billion miles from the sun. The plumes could also erupt from smaller lakes or ponds trapped in the ice [sources: Cook et al. ; Daniels; Lemonick; NASA]. Europa's liquid saltwater ocean, which could reach 100 miles deep, explains why we recommend this moon's fountains over the ice-and-dust geysers of Saturn's Enceladus; outside of Earth, it alone offers a chance to dive a submarine into waters potentially populated by extraterrestrial life [sources: Cook et al. ; Daniels; Lemonick]. With its lakes, riverbeds and deltas, Saturn's largest moon appears familiar at first, but think twice before taking a dip in the hydrocarbon lakes or catching its methane raindrops on your tongue. Even the ice volcanoes (cryovolcanoes), like 5,000-foot- (1,500-meter-) high Sotra Patera, erupt with frozen water and ammonia (or maybe asphalt) instead of lava [sources: Lovett; NASA]. Still, Titan is the only known spot in the solar system (besides Earth) that features surface lakes, and for scenery you can hardly beat the Lake Michigan-sized Ontario Lacus nestled in its surrounding hills of water ice. Sit on a frigid beach (temperatures average minus 290 F (minus 179 C)) and enjoy the unusually tall, notably leisurely waves rolling in, a side effect of Titan's low gravity [sources: Ghafoor et al. ; NASA]. Titan also stands out as the only known nonterrestrial landscape where rain falls on solid ground. Moreover, because of the moon's soupy atmosphere and low gravity, Titan's rains, like its waves, are unusually big and slow. Even the largest drops, which are 1.5 times the size of Earth's, drift down like snow. It doesn't rain often on Titan, but you can hedge your bets by hanging out at the poles which, as it happens, are also home to most of its lakefront property [sources: Grossman; Lorenz; Rincon]. Take a trip to the wrong side of the tracks -- and, by tracks, we mean the Kuiper Belt, the doughnut-shaped ring of icy worlds and short-period comets circling beyond Neptune's orbit. Out there drifts the troublemaker, a gleaming dwarf planet so cold (minus 359 to minus 405 F, or minus 217 C to minus 243 C) that its thin atmosphere freezes, falls and glazes it like a moon-sized doughnut hole. Namesake of the Greek goddess of discord, Eris earned its official label from its role in Pluto's rancorous demotion from planetary status. The discovery of additional planets past Neptune -- particularly Eris, which then seemed larger than Pluto, but might be smaller -- convinced astronomers that the ninth world should be reclassified as a dwarf planet. Its sole moon is named for Eris' daughter, Dysnomia, goddess of lawlessness [source: NASA]. Eris is too distant to see well, but we know it reflects light as brightly as newly fallen snow and takes 557 years to orbit the sun. As the solar system's most distant dwarf planet, it's second only to Pluto as a Kuiper Belt staging ground, and makes a better jumping-off point for the Oort cloud -- the shell of long-period comets and icy bodies located around 5,000-100,000 astronomical units (AU) from the sun. Both merit a trip: Visiting them is like traveling back in time to the solar system's earliest days [sources: Martin; NASA]. If hanging out on Eris and exiting the solar system leaves you feeling rebellious, your next stop should surely be a rogue planet. Many of these nomads came from good solar families but were thrown out when they became too rambunctious. Maybe you can identify [source: Mosher]. Or maybe we're taking this bad boy/bad girl thing too far. Maybe you're of a more scientific bent, or perhaps you're the romantic type. Well try this on for size: A lone planet, circling the galactic center with no sun to light it, warmed only by internal radiation. Research in the past decade has suggested that such planets might far outnumber stars in the sky, a hidden majority of failed suns or rocky worlds wandering the void, occasionally drawn into the orbits of unfamiliar stars or black holes [sources: Mosher; Phillips]. In 2013, a paper announced finding such a free-floating world in our stellar neighborhood. PSO J318.5-22, a gas giant tilting the scales at around six Jupiter masses, floats a mere 80 light-years from Earth. You might want flip on your infrared sensors to find it, though, because it's optically about 100 billion times dimmer than Venus [sources: Boyle; Liu et al.]. By now, maybe you're getting a little homesick, or maybe you just need a survivable place to park while you work on repairs. We can't guarantee it'll provide much of a vacation spot, but at least in the Gliese 581 system you'll have your pick of two planets in the habitable zone: d and g. Habitable options around other stars include Gliese 667Cc, Kepler-22b, HD85512 b, Mars and, for a while at least, Earth [source: Torres]. As of February 2014, NASA's Kepler spacecraft has located 3,601 exoplanet candidates and confirmed 246. But few planets can compare to Gliese 581g in terms of human-friendliness. A rocky planet with a radius about 1.5 times that of Earth, it orbits closer to its star than we do, but remains in the habitable Goldilocks zone (neither too hot nor too cold for liquid water) because its red dwarf only pumps out about one-hundredth the solar energy our sun does. On the Earth Similarity Index measuring 0-1, it clocks in at around 0.92 – beating out former frontrunner Gliese 667Cc [sources: NASA; Torres]. Of course, it's not all beer and Skittles. Gliese 581g is tidally locked, meaning that the same hemisphere always faces its sun as it zips around its 37-day orbit (we hope you like birthdays and anniversaries). Just set your navigation system for the constellation Libra and make sure you've got enough fuel to make the 20-light-year jaunt [source: NASA]. Few places in all the universe capture the grandeur and sheer scale of space as effectively as a stellar nursery -- a giant cloud in which gas and dust contract to form new stars. And NGC 604, located in M33, aka the Triangulum Galaxy, is a whopper, a massive emission nebula spanning 1,500 light-years [source: NASA]. That's 8.8 quadrillion miles (14.2 quadrillion kilometers) -- over 350 times the distance separating us from our nearest stellar neighbor, Proxima Centauri. We recommend finding a good, distant parking space from which to view it. About 3 million years ago, NGC 604 started collapsing into dense pockets and popping off A LOT of stars -- enough stars, in fact, to constitute a globular cluster. Globular clusters are gravitationally close-knit, roughly spherical collections of 10,000 to 1 million stars, all sharing the same approximate age and initial composition [sources: Martin; NASA; NASA; NASA]. While there, pop in some Pink Floyd and get lost in the nebular glow as more than 200 newborn, hot, massive, stars strip the electrons from unsuspecting atoms [sources: Martin; NASA; NASA; NASA]. How better to top off the ultimate space-time sightseeing trip than with a slow plunge into a realm where time and space get tied into the physics equivalent of balloon animals? We're referring, of course, to a black hole -- a supermassive one. Go big or go home, right? Sure, but there's a better reason: In a smaller black hole, your trip would zip by in an eyeblink; even assuming you could survive its steeper 1-million-G taffy-pull of tidal forces, you would hit the singularity just 0.0001 seconds after flashing across the event horizon. Conversely, in supermassive black holes, the event horizon's gravity "slope" is much gentler -- less than one Earth gravity -- and the trip lasts entire seconds. So welcome to the most monstrous black hole yet found, the 17-billion-solar-mass monster that dominates the galaxy NGC 1277 [sources: Crockett; Hamilton]. As you fall on your slow curve, the starfield takes on the colorful whorls of soap bubbles. Space-time tricks your binocular vision, twisting and jumbling light. Finally, just before known physics takes a permanent powder, the universe crushes down into a halo of blue light, bookended above and below by spectral redshifts [source: Hamilton]. After that, who knows? You're in a ship that defies physics, in a region of space that breaks its laws. Anything is possible, so bring a clean change of underwear and, wherever you end up, start your own list of places to see. We're counting on you. Scientists released the first ever image of a black hole; this one lurks in the center of the galaxy Messier 87 (M87). Learn more at HowStuffWorks. When compiling a list so close to my heart, the hardest part is settling on only 10 destinations. Had I had more space, I might have recommended visiting the crater-cutting cliff of Mercury's Beagle Rupes, or seeing what destruction Venus' temperatures and pressures have wrought on the Venera probes. Moon-wise, I'd have dispatched you to Jupiter's Ganymede, which is so large (three-quarters the size of Mars) that it would be considered a planet if it orbited the sun; pizza-faced, volcanic Io; the ridges of Saturn's Iapetus; or Neptune's moon, Triton, a nitrogen-frosted cantaloupe orbiting at 157 degrees to the orbital plane, which one day might go to pieces and grant its planet even grander rings than Saturn. More exotic delights beckoned beyond the solar system, including Hoag's Object, a strange ring galaxy, and its thematic counterpart, the "Eye of Sauron" created by a luminous ring orbiting the star Fomalhaut. There was the pink planet, GJ 504b, or the blacker-than-pitch planet, TrES-2b, or the hellscapes of KIC 12557548 b, Kepler-36c or HD 189773b. In the end, space is too amazing and terrifying to be contained in one list, so I hope some of you reading this will view it as a jumping-off point for your own adventure. At risk of being called corny, I'll close with the following thought: The Ship of the Imagination is all fueled-up. What's on your itinerary? Can someone own the moon? What if a black hole formed near our solar system? Hamilton, Andrew. Professor, Department of Astrophysical and Planetary Sciences, University of Colorado at Boulder. Personal correspondence. Feb. 10, 2012. Martin, Elizabeth. "A Dictionary of Science (Oxford Paperback Reference)." 4th Ed. Oxford University Press. 2003. Miller, Ron. "Seven Wonders of the Rocky Planets and Their Moons." Twenty First Century Books. 2011.